Most dogs love riding in the car. When the rear door is open they eagerly leap onto the back seat to join their owners for an excursion. However, a significant minority of dogs despise automobile travel. Due to enduring motion sickness or an imprint from a prior episode(s) of motion sickness, the dogs may stubbornly refuse to enter a vehicle. In severe cases, they may even become fear aggressive toward the owner if the owner forcefully insists that the noncompliant dog come along for a ride. In anticipation of entering a vehicle or during travel, dogs who are experiencing or who have experienced motion sickness may exhibit full-blown panic attacks that include accelerated respiration, rapid pulse, drooling, and trembling. They may become catatonic or stuporous from fear. In addition or alternatively, dogs that experience the physical and/or psychological effects of motion sickness may become physiologically nauseous and vomit, which makes for an unpleasant cleanup at the completion of a journey. Certainly, when a dog routinely exhibits motion/car-sickness, a joint human-canine vehicle expedition is an odious travail for both the human and the pet. Motion sickness usually begins during puppyhood. The cause may be physiological or behavioral or a combination of the two. The most common physiological cause is related to the vestibular system. The vestibular system of the inner ear, which consists of the semicircular canals and otolithic organs, may not fully develop until a dog is 6 or more months of age. 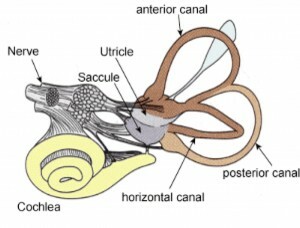 The semicircular canals interpret rotational movements. The otolithic organs interpret linear acceleration. Together they provide equilibrioception, balance, and spatial orientation. In a situation where a dog begins car travel before the vestibular system is adequately developed or when the vestibular system is improperly developed motion sickness is a possible result. As full development of the peripheral nervous system and vestibular system completes, some dogs will accordingly outgrow motion sickness. However, in other cases, even though the initial origins of the behavior are no longer pertinent, fearful behavioral imprints psychosomatically cause the symptoms to endure. Moreover, due to disease, trauma, or congenital defects that affect the vestibular area, some dogs may permanently have issues with motion, balance, spatial orientation, and equilibrium in a manner that affects the dogs’ ability to physically and psychologically accept automobile travel. In other cases, the original etiology may be purely psychological. Some puppies may develop car phobia and resultant motion sickness even when their vestibular system develops on schedule and develops properly. Dogs are outstanding at learning from classically conditioned sequential associations. 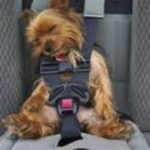 Consequently, if car travel frequently equates to arrival at an unpleasant destination, such as a veterinary visit where the dog will be poked, prodded, restrained, and injected, then the dog may develop anxious, fearful, or phobic panic-responses or nausea when he/she believes car travel is imminent or during the ride. The preceding is especially likely when a dog makes frequent trips to the veterinarian during puppyhood, soon after adoption, or while being treated for a prolonged illness or condition. The preceding is less probable when many fun jaunts (training, play dates, dog park) are interspersed amongst only a few, infrequent unpleasant destinations. Regardless of the original etiology, we highly recommend promptly addressing the condition, as the longer motion/car-sickness festers the more difficult it is to resolve. Fortunately, there are a number of solutions that alone or in combination may minimize or eliminate the symptoms of motion sickness, regardless of whether the present cause is primarily physiological or psychological. a) Have your dog ride in a crate or restrained by a seat belt, which should reduce motion and increase his perception of security. b) Have your dog wear a “Calming Cap,” which you can purchase from CPT. The Calming Cap will reduce the amount of visual stimulation he/she receives. c) Block the side windows alongside the seat level where he/she rides. Motion perception during car travel is greatest when the rider looks sideways, rather than frontward. 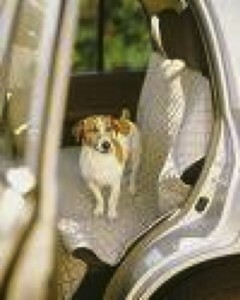 d) Lower the side rear windows slightly, which may better adjust internal compartment air pressure to your dog’s liking. e) Keep the car A/C on, so that your car is cool and well ventilated. A poorly ventilated or hot car is more likely to provoke nausea. 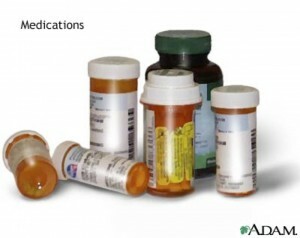 Please note that the following is merely a list of medications that may help in cases of canine motion or car sickness. Please confirm with your veterinarian regarding the safety, appropriateness, and dosage relative to your dog, regardless of whether the medication is available over the counter or exclusively by prescription. a) Antihistamines– Several antihistamines, especially older first-generation antihistamines, help to reduce motion sickness, nausea, and concomitant vomiting by binding to histamine receptors within the vestibular system. Over the counter– The over the counter antihistamines most commonly used to combat motion sickness are: Dimenhydrinate (Dramamine), Diphenhydramine (Benadryl), and Chlorpheniramine. Their most common side effect is drowsiness. Meclozine (Bonine, Antivert, Sea Legs, Dramamine- Less Drowsy) may cause less sedation than other OTC antihistamine choices. Prescription– The most common prescription antihistamine used to combat nausea is Promethazine (Phenergan). Cyclizine (Marezine) is another prescription antihistamine that can have potent anti-nausea effects due to its associated opioid enhancing and anticholinergic/muscarinic effects. Both Promethazine and Cyclizine are chemically similar to Dramamine, which is available OTC. b) Anti-nausea/anti-emetic drugs– Anticholinergics and dopamine antagonists counter the autonomic retching and vomiting reflexes signaled by the chemoreceptor trigger zone within the fourth ventricle of the brain. The CTZ contains afferent cranial nerve pathways from the muscarinic and histamine receptor plentiful vestibular system. The CTZ may also be activated from the highly muscarinic-cholinergic Vagal nerve which emanates from the gastrointestinal system. Once activated by an appropriate input source, the CTZ sends efferent signals through the Vagal and Enteric neural systems that stimulate retching and vomiting. Scopolamine– A plant-derived muscarinic antagonist/anticholinergic alkaloid drug commonly prescribed for human motion sickness. With humans, usually given through a transdermal patch. But, scopolamine is also available orally. Not commonly used with dogs. Mirtazapine (Remeron, Avanza, Zispin)- A tetracyclic-antidepressant that functions as an anxiolytic and anti-emetic. Maropitant (Cerenia)- A fairly new drug (2007) approved by the FDA specifically to treat motion sickness and vomiting in dogs and cats. The drug acts as a neurokinin 1 antagonist that affects Substance P reception in the medullary center that prompts emesis. Non-sedating. c) Anti-anxiety drugs– Since anxiety may cause or exacerbate symptoms of motion sickness, short-acting anxiolytic medication may be beneficial. Diazepam (Valium)- A GABA enhancing drug in the benzodiazepine family that functions as an anxiolytic and mild sedative. a) Do not feed your dog prior to car trips or feed him/her a reduced portion. a) After placing your dog in the car, give him/her a bone or other stimulating chew item within his crate, so that he may better redirect focus from the car/drive to the pleasant emotions prompted by the chew item. In addition, chewing can create a dopamine release that will help to physiologically relax your dog. 1. With all four doors open and the car stationary, feed your dog in the car or throw a toy into the car. During this time and until the stages advance, only take him/her into the car when it is stationary. Do not take him for actual travel unless required due to emergency. 2. When your dog enters willingly and comfortably, complete the above drill with only 3 doors open. Once he/she fetches the ball or eats the food allow him to depart the vehicle. By using small portions of food or throwing a highly-valued treat or toy, you can complete several repetitions during each desensitization training session. 3. When he/she enters willingly and comfortably, complete the above drill with only 2 doors open. Please note that each stage may last only a day or may last several weeks, it depends on the rate of your dog’s anxiety reduction. 4. When he/she enters willingly and comfortably, complete the above drill with only 1 door open. Keep the remaining door open during this stage. Still allow him to depart immediately after he eats the food or treat or fetches the ball. 5. When he/she enters willingly and comfortably, have him sit and wait, then enter a crate within the vehicle. Once he is inside the crate, give him a chew item or treat. Then, close the car door. Have him remain in the crate/closed car for only 5 seconds, then allow him to depart the car. 6. 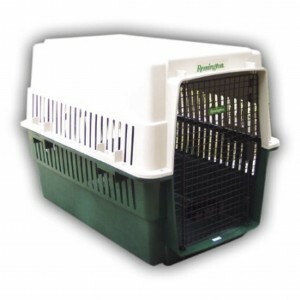 When he/she enters the crate willingly and comfortably and remains comfortable once the door is closed, extend the time he remains in the non-moving car from 5 seconds to 15, 30, 60, 90, and 120 seconds, then to 3, 4, and 5 minutes before he is allowed to depart. Only extend the time if he remains composed. If he becomes anxious, do not extend the time. 7. Next, place him/her in a crate in the car, give him a chew item, toy, or treat, close the car door, and start the car- but, do not place the car in motion. Idle for 5 seconds, then allow him to depart. Gradually extend the time as with the above drill. 8. Once starting the car, drive up and down your driveway. Allow him/her to depart immediately upon stopping. Play with him afterward. 9. Drive around the block. Return home. Allow him to depart. Play with him. 10. Take him/her for increasingly longer rides, provided he can handle the time extension with emotional comportment and without any physical signs of nausea. Although motion/car-sickness is a condition that may lower the quality of life for you and your dog and that may limit the amount and/or type of activities you engage in with your dog, there are a number of potentially potent solutions. If you observe motion/car sickness, first determine the most probable causation. Then, immediately begin a solution plan by speaking to your veterinarian about pharmaceutical options and by implementing the behavioral treatment plan described above. If you require assistance in diagnosing the source of the problem or in implementing any of the above solutions, we highly recommend contacting a CPT behavior modification expert for an in-home private lesson. © Copyright Mark Spivak and Comprehensive Pet Therapy, Inc., June 2011, Revised February 2014. All rights reserved.